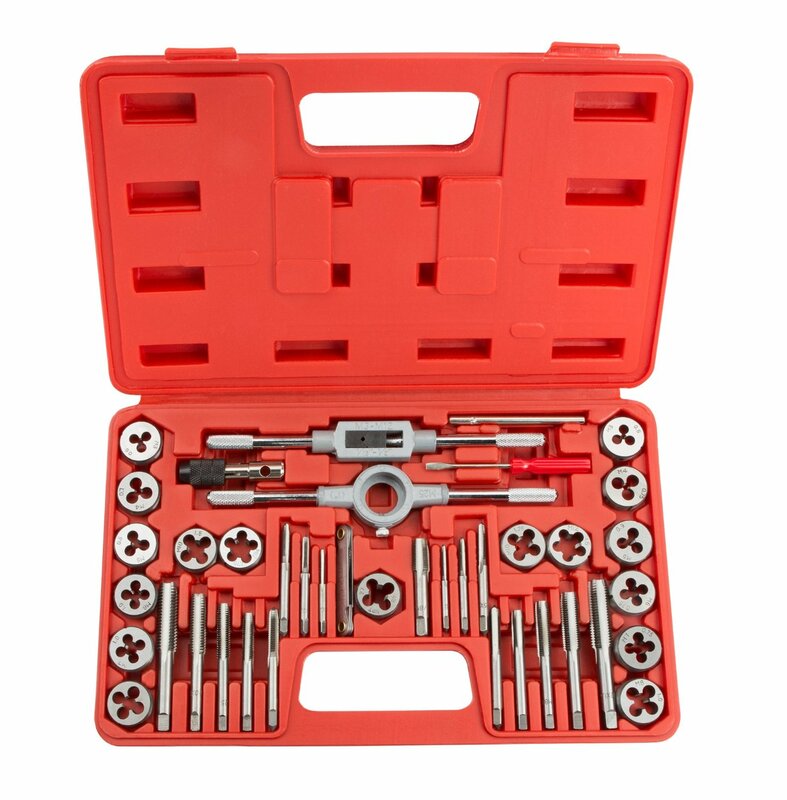 What is a tap and die set and how do I use them? How do I use a tap and a die? 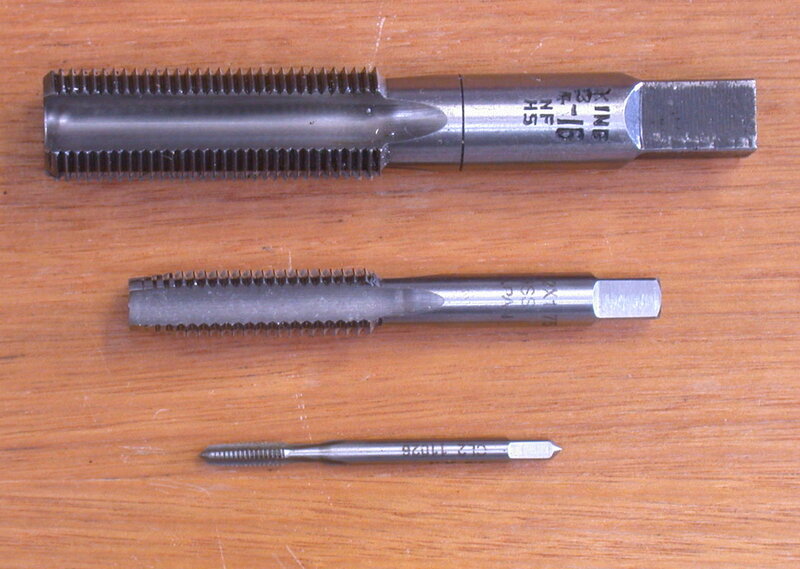 A tap and die set allows one to create threads for bolts and screws. 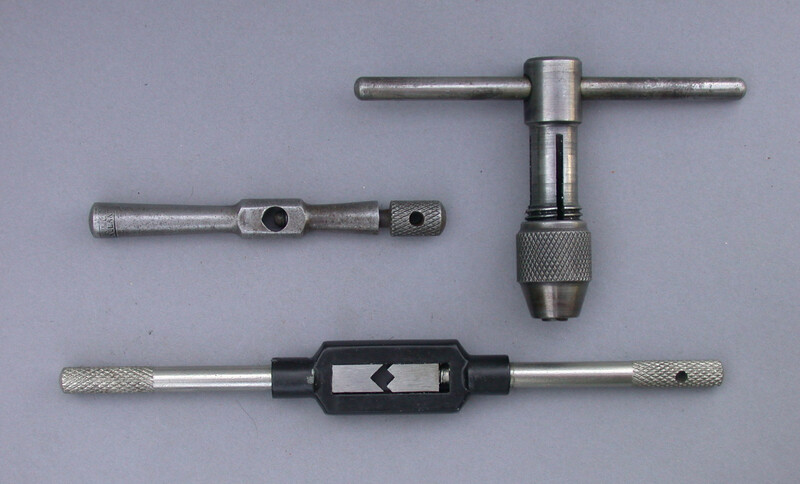 A tap wrench is used in conjunction with a tap (that looks like a drillto create internal (female) threads in metal sheets or blocks, for screws and bolts to fasten onto. The choice of tap will govern the diameter and pitch of the resultant internal thread. A die stock is used in conjunction with a die to create external (male) threads, usually on plain rods, for nuts to fasten onto. The choice of die will govern the diameter and pitch of the resultant external thread. Make sure the tool you are using is hard enough for the metal you are trying to work. There are cheap sets out there that will only work on nonferrous metal and will be instantly ruined even by use on mild steel. Don't waste money on such a set. Decide if the hardest material you will cut will be mild steel or stainless steel and buy a decent set accordingly. The dies should last a lifetime. The taps less so (see below) so you should expect to buy individual taps periodically. Lubricate and back off your work regularly to clear out the chips of metal. Taps, however, are much more of a problem. A good set of taps will contain three taps of the same thread diameter/pitch. The first will be strongly tapered, enabling an easy first cut. The last will have a square end for bottoming out blind holes. The second will be intermediate between these two in form. If you only intend to make through holes, you can get away with the first one. On the other hand, trying to start a thread with the last one is impossible. Taps are hard and therefore brittle. Small taps break very easily. Larger taps don't break so easily (though I have managed to break an M12 tap on stainless after it got stuck and refused to move forwards or backwards.) Any decent tap is too hard to drill out, so proceed with caution, as a broken tap can be a real problem. Do all of the following. Drill a straight hole in the correct diameter (It's easy to google tables for the correct drill size, and some of them are slightly unusual.) Depending on your application, you may be able to get away with a slightly larger hole diameter. Going even 0.1mm smaller because you don't have the right drill is asking for a broken tap, unless you are using aluminium. Back off regularly to release chips. Keep the tap straight and avoid lateral force. If the tap breaks go here. Also see this question for broken drills. The set will come in SAE or Metric, covering both fine and coarse thread pitches. There are three basic items to be found in the set. The tap (long straight pieces) which are used to cut threads on the inside of metal, like in making a bolt hole. 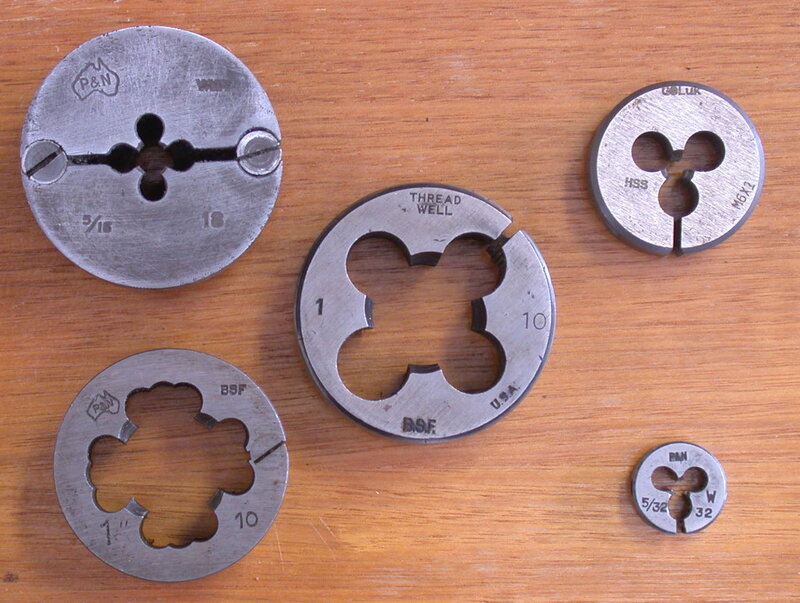 The die (round pieces) are used to cut threads on the outside of metal, like for creating threads on bar stock. The two two long pieces at the top of the set are the handles which allows you to use the tap (top) and die (bottom). To use a tap, you need to have a starter hole of the appropriate size. This is going to be just a bit smaller than final size of the threaded area you are trying to create. Take the tap out of the case and insert the square end into the tap handle. Place the tap square to the drilled area and carefully begin turning the handle. You'll want to use copious amounts of cutting fluid (WD-40 works well for this). You start to feel the teeth on the tap bite into the metal. As soon as you feel an appreciable amount of resistance, you'll want to back the tap off of it some to allow the cutting teeth to clear the debris, then turn the tap back into the cut. Run the tap down the distance needed for threads. A die is used much the same way as a tap as far as how to cut the threads. You'll want to make sure the stock you are using is small enough for the die to be able to make the initial cuts. You'll also want to hold the stock in a bench vise so it will stay still while cutting the threads. Sometimes it makes it easier to start the cut if you bevel the leading edge using a bench grinder. To start the cut, keep the die perpendicular to your stock. While starting to turn, press down on the die until you start to feel the teeth bite into the stock. Again, use some type of cutting oil to keep things lubricated. Run the die down some, then back it off to clear the cutting teeth. Continue cutting down the stock for the length of threads needed. It is of note that cut threads on stock using a die will not create the same strength as rolled threads you'll get from a normal bolt you pick up that the hardware store. You'll also hear the term "chase the threads" or just "chase threads" used in conjunction with taps/dies. This is the process of cleaning up threads which may have been damaged during whatever work may have been going on. It is the same basic process as creating new threads, but you are only trying to get the old threads back to a usable state. Which is stronger: solid sockets, or two piece sockets? What is the difference between an automatic torque wrench and a click wrench? Rusted gas tanks, how do you repair them? What to use to lock two flanges together?